Geothermal Energy – You're Standing On It! Geothermal energy is a powerful energy source, right under our feet. Just as people in cold countries sometimes slept on top of their stoves at night, we live on top of a giant heater: the Earth. And you can actually employ this energy in your home trough using geothermal heat pumps. More about that later. "Geo", a Greek word, means "Earth." "Thermal", from "therme", means "heat." The deeper into the Earth, towards its centre, the hotter it gets. Why are these insides of the Earth so hot? This heat comes from the Earth's heart, it's hot solid, iron core. Around the solid core is the molten core, which is magma. It's surrounding mantle is made of magma and rock. Capping all this is the Earth's crust. All this hot activity under our feet goes back right to the Big Bang, some 13.7 billion years ago. That's when a superhot cosmic soup exploded and expanded and formed the galaxies and planets that we see. The Earth first formed more than four billion years ago from these building blocks: gases and solid matter. Even if your memory might not stretch that far back, you can readily see that life's present existence on Earth was made possible through the precise circumstances of these distant events. The Earth has cooled down during that time, but is still simmering away underneath. Heat flows from the Earth's core into the mantle all the time. That's our earthy energy source: the Earth's heat. 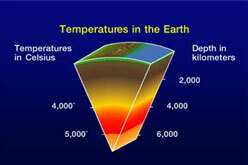 Generally accepted estimates are of temperatures around 7,200 Fahrenheit (or 3,982 Celsius) at 2,500 miles deep (or 4,032 km). More recent estimates say that at the boundary between the Earth's core and its mantle, heat measures around 6,665 degrees Fahrenheit (3,677 Celsius). That's at a depth of around 1,860 miles (3,000 km). Whichever..., that's hot enough to boil your billy! Oh, sorry, that's an Australianism. Lets say, it's hot enough to boil any kettle of water many times over, and melt the darn thing itself as well. Today's Earth's crust is of course the land that we live on. Where the mantle is close to the surface geothermal Source: Geothermal Energy Assoc. energy can be observed in the form of volcanoes, geysers, hot pools and mud pools. Iceland, New Zealand's Roturua and America's Yellow Stone Park are known for their geysers and hot pools. And I'm sure you can name one or two volcanoes yourself. That's exactly where geothermal energy lies closest to the surface. But it can be accessed in many places. So, these underground energy reservoirs are ancient in their origin, and are powerful, well-available sources of energy. How does this energy come to the surface? You already know that magma has ancient origins, going back to the Earth's formation. So, how does water get there then, deep in the Earth? Good question! It usually gets there through rain water trickling down rock fissures. Where a lot of it collects in underground aquifers, and is heated by the Earth, it expands and may rise to the surface as water or steam. Hot water in such geothermal reservoirs can reach temperatures of 700F (or 370C). Now this source of heating energy has been used by people for many centuries. Hot springs have long been used for cooking and for healing properties. At ancient Pompei the Earth's energy, carried by hot water, heated its buildings, using a simple form of geothermal heat pump. It got there in the first place by trickling down through fissures in the rocks. So that's one type of reservoir. The third way of getting at this energy is facilitated by humans. It involves injecting water at high pressures deep into porous heated rock formations and retrieving it as hot water. I'll say a lot more about that in answering the question what is thermal energy. Modern human use of geothermal energy derives two types of power. Geothermal energy is accessible in many places. In the USA alone, recoverable geothermal energy is thought to represent 130,000 times its current annual energy consumption! Geothermal energy is an alternate energy source with a future.